The Metalcraft Practical Punch and Shear Tool is a great 2 in 1 guillotine for steel strip cutting and a metal punch tool that will easily punch 3mm diameter holes in steel strip upto 3mm thickness. The hole punching feature complements the riveting capability on our Practical Riveting Bending & Rolling Tool so that metalwork can be joined together quickly and easily. By placing the steel bar in the slotted and specially machined and hardened punch block and smoothly pulling back on the handle you can quickly and easily punch fixing holes without the need for a powered drill which can tricky to use on curved flat or non flat sections. When used as a steel strip cutter you can feed mild steel strip into the aperture between the specialy hardened large and small blades and you simply push the handle away from you to produce a neat cut in complete safety. These handy metal work tools are also supplied with a special measuring bar that will enable you to achieve consistently accurate cut lengths of steel and also ensure holes can be punched accurately relative to the end of a steel strip or to a neighbouring punched hole. *All sizes are approximate and in mm unless stated otherwise Tools are supplied complete with operating instructions and spare parts lists. Please note: The maximum working capacity is for Hot Rolled Mild Steel Bar and Annealed Bright Mild Steel Bar. Working beyond these limits or with material of greater hardness may reduce the operational life of the machines. The punch blocks, pins and shear blades are all consumable items for which replacements can be purchased readily. To shear, material is placed in gap between small fixed blade and large lever operated blade. 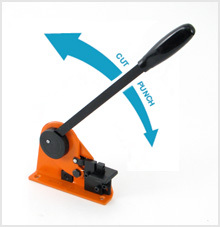 Operate lever smoothly and firmly to cut. Punching is achieved by placing metal strip in the slotted punch block. Platform is adjustable to allow for accurate positioning along the centre of different widths of bar. The distance of hole positions can now be set to give accurate results.